A lot of artists got by in the late 60s and early 70s by essentially aping the style of Frank Frazetta (or producing homages, if you will). Boris Vallejo is probably the best known of these artists today, but Jeff Jones contributed more than his fair share of work to the paperback racks in the wake of Conan the Barbarian. From 1975 to 1979 Jones lived in a Chelsea workspace called “The Studio” with Bernie Wrightson, Barry Windsor-Smith, and Michael William Kaluta. I’m guessing they threw some memorable parties. Jones vanished from the scene in the 1990s or so, and emerged earlier this decade having undergone gender reassignment surgery. She’s now known as Jeffery Catherine Jones, and this interview at Sequential Tart offers a brief glimpse at some of Jones’s thoughts and influences. It’s an interesting read. I have several Jeff Jones covers in my collection, and many will eventually appear here. 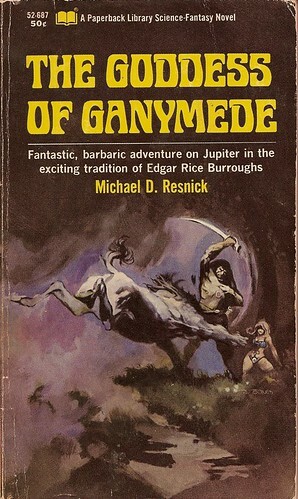 As for the book, The Goddess of Ganymede is the first paperback credit of science fiction author Michael D. Resnick, who enjoys a successful writing career to this day (and who will pen the introduction to the forthcoming Planet Stories edition of Manly Wade Wellman’s Who Fears the Devil?). Resnick seems almost embarrassed by the book (and it’s sequel, Pursuit on Ganymede) today, probably because it is a brazen pastiche of A Princess of Mars, by Edgar Rice Burroughs. I read Goddess last year and found it charming, in the upper-middle tier of “Sword & Planet” novels along with similar 60s work from Gardner F. Fox and Michael Moorcock. I just finished re-reading A Princess of Mars a few weeks ago, though, and upon looking at The Goddess of Ganymede again tonight I can see several places where Resnick could have differed from Burroughs but didn’t. Still, too-slavish devotion to ERB is practically a defining statement of intent for authors working in the Sword & Planet “tradition,” so I can’t hold it against him. I’ve read more than a dozen of these books from nearly as many authors in the last few years, and almost all of them follow an identical pattern—first set by Burroughs back in 1912—in the early chapters. The books usually start with a brief introduction by the author himself, explaining how he came to hear the story of the manly hero and the mysterious circumstances of his life. In this case Mike incompetently builds a short-wave radio which picks up the broadcast of Adam Thane, an American soldier of fortune drafted into NASA’s secret Project Jupiter aimed at beating the Russkies in the Space Race by sending a manned mission to photograph the gas giant’s Red Spot. The story picks up from there with Thane’s narrative, and we’re treated to the usual progression of tropes. The hero somehow gets to the planet. The hero experiments with walking under the lighter gravity that will make him a superman. The hero meets a dangerous, monstrous inhabitant of the savage planet. The hero meets the humanlike inhabitants of the planet and learns their language. That sequence plays out, in roughly that order, in every single one of these books. After a while it’s interesting to focus on what makes sword & planet stories different even within the formula, and here Resnick’s crashed rocket and Cold War in space references anchor the book firmly as an artifact of its time. Mike won’t let me republish it, so I suggest you hunt down a copy and check it out for yourself. I may just have to look these up… Glad to see you posting here again. I repost most Paperback Flash posts to my LiveJournal, Lemuria Press. You may view my post-1980 career, with its dozens of awards and occasional bestsellers, as a public penance for my pre-1980 career.